The degrees of Chapter of Knights of Rose Croix are known as the Philosophical Degrees as they do not use Historical or Biblical scenes to convey their Lessons. 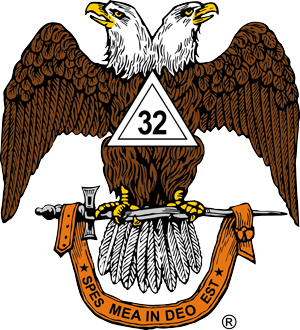 These two degrees are designed to encourage a Scottish Rite Mason to examine his own life and find and apply the major truths outlined in the bible. The 17th degree, Knight of the East and West and the 18th degree Knight of Rose Croix of H.R.D.M., known as the Philosophical and Doctoral Degrees of the Scottish Rite are conferred in a Chapter of Rose Croix. They open a new development of Masonic teaching and are a distinct departure and advance from the symbolism of the Symbolic Lodge and of the preceding Scottish Rite degrees. These deal with the teaching of Jesus; as Teacher, Prophet and Martyr. Whatever your religious faith, you are encouraged to ponder the philosophy and teachings of the Nazarene, especially the doctrine of fraternal love and service toward all mankind. You will learn how the three cardinal virtues of Freemasonry, Faith, Hope and Charity were so beautifully illustrated in the life of Christ. These lessons give spiritual underpinning to the central Masonic concept of “The Brotherhood of Man under the Fatherhood of God.” The Rose Croix Degrees are the spiritual center and among the most important in the whole body of Freemasonry.